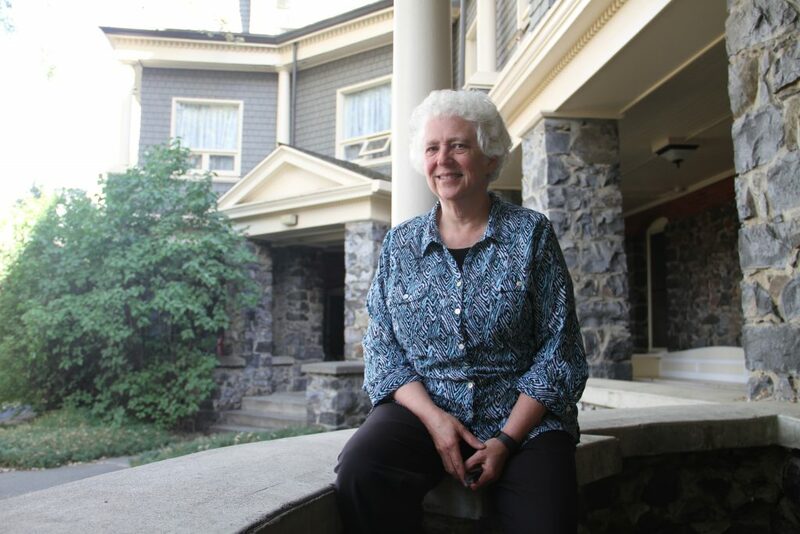 Visiting historic Stevens Hall, Deb Nelson, award-winning instructor in Human Development, helps hundreds of new students stay and succeed through a personal connection (Seth Truscott-WSU Photo). Without a sense of belonging, new students can feel lost and isolated on campus. By connecting them to a community of learners at Washington State University, Deb Nelson, instructor in the Department of Human Development and winner of a 2018 WSU Excellence Award, helps them succeed and stay in school. “Research shows that students who feel like they’re part of a community will do better and stay in college,” says Nelson. Honored for her efforts in the WSU Office of Undergraduate Education’s First-Year Focus Learning Communities program, she works alongside professors and residence hall staff to help students experience classes and campus life together, instead of in isolation. Teaching a freshman-level core class, Human Development 101: Lifespan Development, she instructs up to 300 new students every year, teaching them about the human physical, social and mental development. As part of the First Year Focus program, Nelson’s students all live in the same residence hall, forming a sense of community. Her personal connections begin in the classroom, but Nelson goes beyond the lecture hall, meeting with students for meals, visiting residence and dining halls, and maintaining an open-door policy at her office, listening whenever students want to talk about their concerns. In the wake of student athlete Tyler Hilinski’s death in January 2018, Nelson listened as students shared their feelings of loss and grief, and discussed awareness of depression and suicide prevention. Amid a national debate over immigration reform, she listened as first-generation students shared concerns about their families back home. “It’s not always the big things,” says Nelson, who asks students about their classes and ensures they set goals, meet with advisors, and find campus resources. Now in her 11th year with First-Year Focus, Nelson said she loves seeing the progress that her students make as they complete their first year, choose majors and explore careers, often returning to tell her about their success. Learn about the WSU First Year Focus Learning Communities Program here.